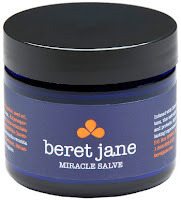 Recently Beret Jane reached out to me about reviewing their wonderful all natural miracle salve. I tried this salve out for over a month and I absolutely love it! Here's what I love about this salve and why I think you should try it now and you will love it too. The beret jane miracle salve is all natural and has 82% organic ingredients. Infused with Calendula, Lavender and exotic butters, this anti-aging, super-healing salve repairs and protects skin. I love this salve because I can use it to moisturize my face with no issues like skin irritation or breakouts. You can use it to moisturize your body, put it in your hair as a pre-treat conditioning treatment or as a leave in conditioning product to add shine and elasticity. You can also use it on various other things like cuts, scraps, burns, bug bites, diaper rash for my little one, nails and cuticles and just about anything else you can think of. Other natural ingredients include: calendula flower extract, jojoba seed oil, mango nut butter, shea butter, and lavender flower oil amongst other extracts, oils, and butters that have countless benefits for the skin. What I love about this company and their product is, their shea butter is fair trade certified and they support many local independent farmers as well as cooperatives. 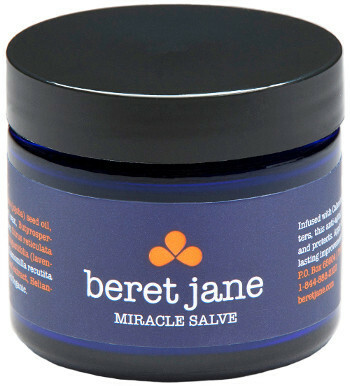 To get learn more about beret jane miracle salve or get yours, please click here.